The Smokehouse Bishop Auckland is probably one of County Durham’s finest hidden gems. Tucked away down a Bishop Auckland back alley, the venue has no sign, no eye catching display and no elaborate gimmicks. In fact, it could be mistaken for an abandoned storage unit, but the food establishment is rapidly gaining an incredible reputation in the area for its locally sourced meaty goodness. Dan and his friends have been there a couple of times before and always returned home with not only the meat sweats but with glorious reviews. So, when this place began serving up Sunday lunches, we thought it was a cracking time for my first Smokehouse experience. There’s no airs and graces about this place, the focus is firmly on good food. Meals are served in take-out boxes, regardless of whether you choose to eat in or not, and the decor is rustic yet simplistic. When we arrived, I was all geared up to take on a mountain of Sunday lunch, but then I read the menu. Apparently, the choice of meats can vary. Due to all of it being locally farmed and produced, it may depend on what meats they can source, or what’s in season. This week was pulled pork, brisket and spicy sausage, all available in a bun if you’d like, as well as chicken wings and chicken legs. I’d already been told just how good the chips at this place were, so once I’d clocked eyes on the spicy sausage number, there was no Sunday lunch in my mind. You know I can’t resist a bit of heat. Dan went for the Sunday lunch with beef brisket. The meat was still pink in the middle and falling apart on the fork – it was absolutely incredible. I almost got the dreaded food envy. Along with the meat, there was a good selection of vegetables, including sweet parsnips and mushy peas. Plus a good dollop of creamy smooth mash, crispy roasties and a thick, soft Yorkshire pudding. It was restaurant quality, and amazingly only £7 including a can of fizzy pop! Whilst the Sunday lunch was amazing, I was chuffed with my hefty serving of spicy sausage, (proper) chips and homemade coleslaw. The sausage had a strong hint of chilli, but thick and meaty too. It was seasoned absolutely perfectly, and teamed up with a good forkful of the coleslaw, it was a champion combination. I couldn’t even tell you what the coleslaw consisted of, it didn’t last long enough for me to find out, but I can tell you it’s some of the best stuff I’ve ever had. The sausages should most definitely be packed up and available to purchase from Smokehouse, they’d make a bonny penny. The chips were really impressive. Proper chips, like your Grandma used to make. Brown and crisp on the outside but soft, thick and fluffy potato on the inside. If you love a good kick to your food, Smokehouse’s chilli sauce drizzled over your chips is an absolute must. 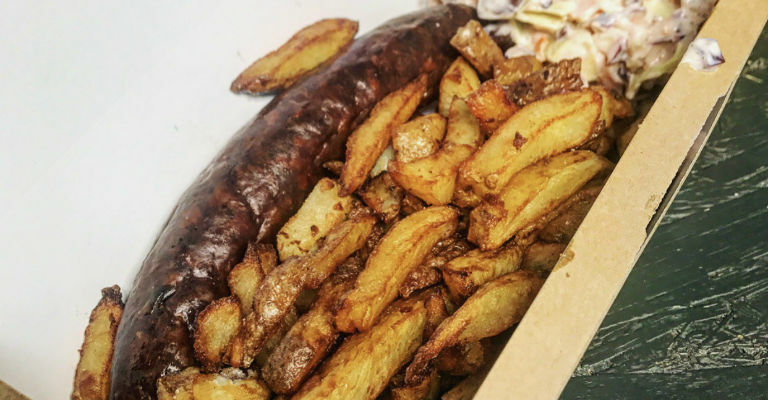 For one meat and one side, it’s usually £7.00 (including your drink), but they have a lunchtime special on between 11.30am and 2.00pm, and you can get this cracking streetfood-esque delight for only £6.00. You can also choose from a jacket potato or salad as a side. If you want, you can even have more than one meat or side too, if you think you can handle it! I already can’t wait to return to Smokehouse Bishop Auckland. And I urge you to, too. But you’ll have to be quick, they run out of food pretty fast due to their growing popularity. Last week, the Sunday lunches had been snapped up by 1.30pm. 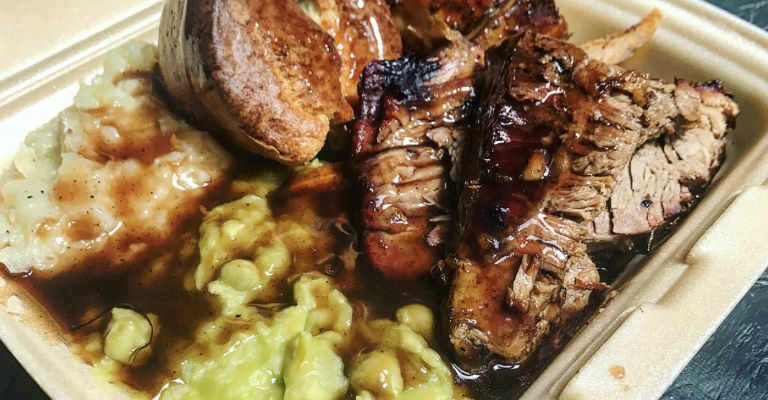 As well as being an independent that utilises local suppliers and produce, Smokehouse is a non-profit organisation, even more of a reason to support this meat-lovers haven. Find out more about the Smokehouse Bishop Auckland on their Facebook page, and read more of Laura’s food reviews on her site Proper Scrumptious.